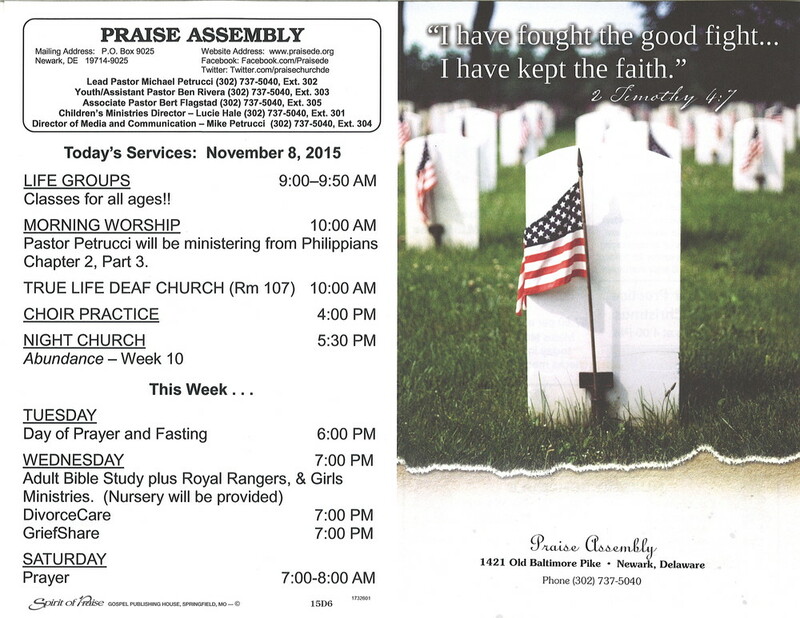 In observance of Veteran's Day, Praise Assembly honors those who have served in our nation's military. If you're separated or divorced, the holidays can be a lonely, stressful, depressing time. But there's hope. Join us for an encouraging seminar that will help you survive the holidays and discover new ways to enjoy them again. 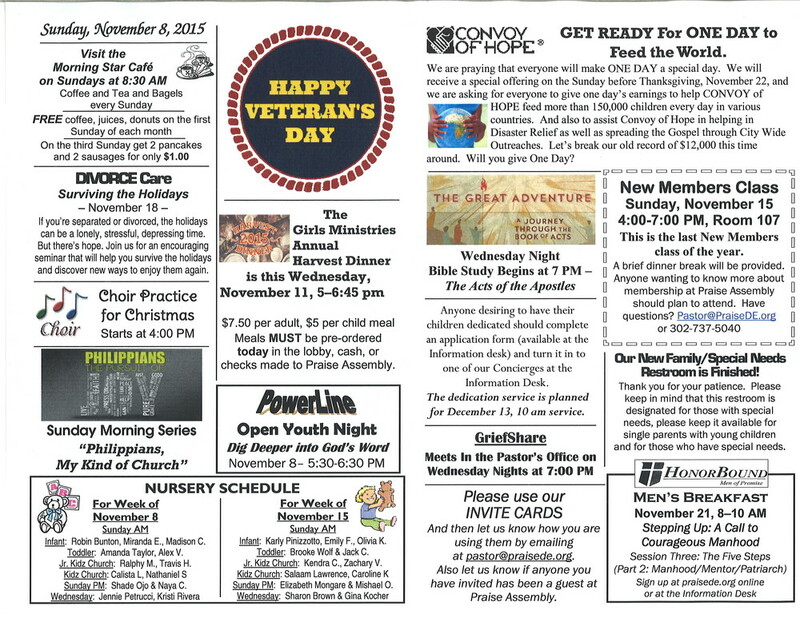 Meals MUST be pre-ordered today (Sunday 11/8) in the lobby. Current Sunday Morning Series: "Philippians, My Kind of Church"
This is the last New Members class of the year. A brief dinner break will be provided. Anyone wanting to know more about membership at Praise Assembly should plan to attend. Have questions? Email pastor@praisede.org or call 302-737-5040. We're praying that everyone will make One Day a special day. We'll receive a special offering on the Sunday before Thanksgiving, November 22, and we're asking for everyone to give one day's earnings to help Convoy of Hope feed more than 150,000 children every day in various countries. And also to assist Convoy of Hope in helping in Disaster Relief as well as spreading the Gospel through city wide outreaches. Let's break our old record of $12,000 this time around. Will you give One Day? Our new Family/Special Needs Restroom is Finished! Thank you for your patience. Please keep in mind that this restroom is designated for those with special needs. Please keep it available for single parents with young children and for those who have special needs. GriefShare meets in the Pastor's office on Wednesday nights at 7 PM. Click here for more information. And then let us know how you're using them by emailing pastor@praisede.org. Also let us know if anyone you've invited has been a guest at Praise Assembly. Anyone desiring to have their children dedicated should complete an application form (available at the Information Desk) and turn it in to one of our Concierges at the Information Desk. The dedication service is planned for December 13, 10 AM service.